There is an old saying that it takes twenty one days to create a new habit. Depending on the situation and the choices made, that could be positive or negative. Simply put you could create a good habit or a bad one. Twenty one days sounds like a lot but .... in reality time goes so quickly. I wrote down on sentence last Monday. It has impacted me in more ways than I possibly could explain here today. That's right! 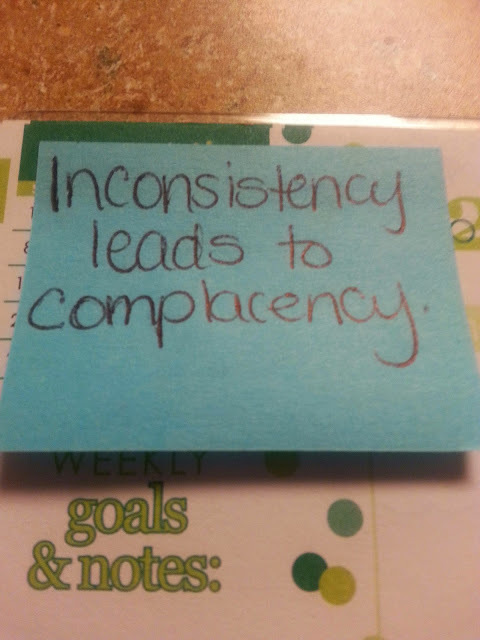 Inconsistency leads to complacency. When I wrote it, I was a bit upset because my in my immediate situation there hadn't been any consistency for months, and it was nothing of my own doing. Now I realize it was there to remind me WHY consistency is so important in not only our lives but the lives of our children, their children and so forth and so on. Here were a few notes I jotted down. *Inconsistency leads to consistent bad habits and unavoidable consequences. *Inconsistent people struggle with relationships ~ both professional and personal. Negativity usually has more power over positively. In fact, if you are working hard to create a new habit and decided on a whim out of emotion to skip "that" today you really set yourself back to the beginning. This is an area that I hear many women discuss but sadly there is mor etalking about the problem than finding a solution. I love this quote: "Most people are more comfortable with old problems than with new solutions" ~ anonymous. I truly know how that feels on both ends. The receiving end and the doing. But there is hope! It can however be fixed! It may take 21 days (or longer) but any behavior can be created or fixed. I cannot however promise you that the damage done (consequence) will be fully repaired, but it can at least be a stepping stone for a life of consistency. No matter what area you are inconsistent in, I will give you three steps that will lead you to living a more consistent life. 1. Evaluate your plan of action and see if it is doable, reliable, and determine if it sets you up for success or failure. Make changes accordingly. 2. Make a chart to keep track of your progress. 3. Be honest with yourself. If you lie to you ~ you only look like a fool not only to everyone else, but more importantly to yourself. 1. Your children. You lose trust and guidance. 2. Your spouse. You lose trust, companionship, and eventually the relationship. 3. Coworkers & Boss: You lose credibility, trust, and eventually your job. 4. Friends: You lose trust, and perhaps the relationship. Make some steps today and realize it is not worth losing what you have for your inconsistency in whatever area your struggling in.